For all the fantastic graphics and immersive gameplay offered by modern games, there is still something special about booting up old PC games. Playing one of these classic titles can fill you with nostalgia. So we have compiled a list of the best old PC games you should still seek out and play today. When Blizzard announced legendary real-time strategy StarCraft was receiving a graphical overhaul, it also announced that the original (and its expansion, Brood War) would become free to anyone. Blizzard kindly patched StarCraft, modernizing various outdated aspects and fixing several bugs on the way. 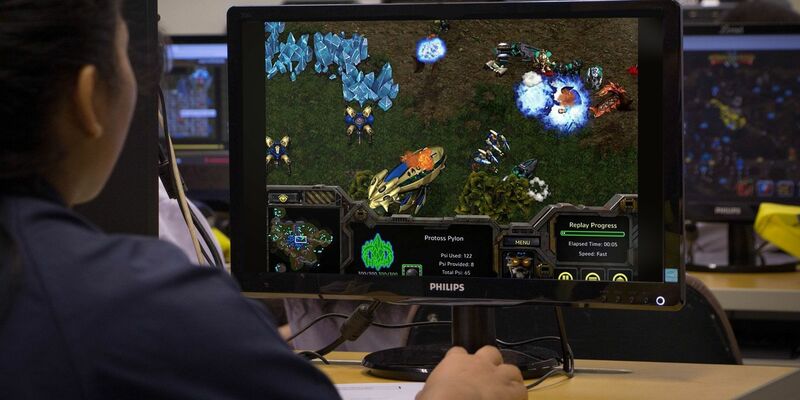 StarCraft is one of the godfathers of the real-time strategy genre, with many of the best modern games taking inspiration from its strategies, factions, and more. Which makes it more than worthwhile playing again. Quake is the best first-person shooter of all time. There, I said it. Id Software's return to the first-person shooter genre was a massive critical success, and it remains excellent, even today. You fight your way through four worlds filled with all manner of horrific beasts, from the basic Grunt to the terror-inducing Shambler, and into the depths of Shub-Niggurath's Pit. And that's without even considering Trent Reznor's incredible soundtrack. There are also several Quake expansions, all available on Steam and on GOG. Grim Fandango was a revolutionary adventure game developed by LucasArts. Grim Fandango was a step forward for LucasArts, bringing its vision of the adventure genre into the then-modern era. Grim Fandango's film-noir, Day-of-the-Dead inspired characters must work through the Underworld, finding objects and solving puzzles to reach the final destination. The largely pre-rendered 3D environments were visually interesting and it has one of the best soundtracks of any game, ever. Despite this, Grim Fandango bombed. It did so badly on release that it compounded LucasArts decision to leave the adventure genre and focus on other titles. Yet, despite the negative reaction to the original, Grim Fandango is regularly touted as one of the best games of all time. In 2018, developers Double Fine Productions released Grim Fandango Remastered. This includes new high-resolution characters, repainted scenes, dynamic lighting, and more tweaks and bugfixes. The updated Grim Fandango is one of the remastered video games worth playing again. 1999 was a monumental year in video games. Final Fantasy VIII, Silent Hill, Super Smash Bros, EverQuest, Tony Hawk's Pro Skater, Unreal Tournament, Gran Turismo 2… the list is just incredible. Adding to that list is classic role-playing horror-survival, System Shock 2. System Shock 2 starts with a classic horror trope: a mysterious distress call coming from a distant space sector. And you're sent to check it out. I won't say more than that. System Shock 2 offers an excellent storyline, immersive soundtrack, and a few jumps and scares along the way. System Shock 2 lead developer, Ken Levine, would find success with another modern series you might know: Bioshock. Bullfrog were the masters of irreverent management-sim humor. Theme Hospital's jokes still hold up today, from the critical receptionists to the ridiculous diseases like Bloaty Head and Jellyitus. Theme Hospital's campaign mode sees you take control of a succession of hospitals, competing against other healthcare facilities in the same locale. There are targets, inspections, emergencies, earthquakes, and sickness outbreaks to deal with, all while turning a profit. If you're looking for a modern version of Theme Hospital, I'd strongly advise checking out Two Point Hospital. It is the spiritual successor, made by former Bullfrog developers. Baldur's Gate II is one of the best RPGs, up there in the pantheon of RPG classics. What sets Baldur's Gate II aside is the wonderfully intricate level design. The entire world is beautiful and urges you to explore to the depths of Amn. Baldur's Gate II was exceptional for its approach to its storyline and your character. Being a game of Dungeons and Dragons at heart, you can warp your character into different configurations, being rewarded with different outcomes, reactions, and events. OpenTTD is the open source port of Chris Sawyer's classic, Transport Tycoon Deluxe. OpenTTD takes the core gameplay of Transport Tycoon Deluxe and builds on it in so many ways. Custom train sets, advanced signals, user-made buildings and stations, entire industry overhauls, and much more await you. You can forgive yourself for starting a quiet game of OpenTTD in the evening, and suddenly realizing it's morning as you try to bring MagLev to the inhabitants of Little Plingfingpool. Before the modern open-world RPGs you know the Fallout series for, it was a pixelated isometric piece of genius. Fallout 2 lets you do anything. You can complete the game how you want, on your own terms. The character customization is what makes the Fallout series great, and that is one of the enduring features of the series (though, Fallout 4 somewhat dropped the ball, but that's another story for another day). Fallout 2 has incredible depth. It is unforgiving. But if you have never taken the time to play the game, do it, and it will change how you feel about the modern iterations. Half-Life is the precursor to Half-Life 2, widely regarded as one the best games ever. Half-Life is where the story of Dr. Gordon Freeman begins. You must fight your way out of the Black Mesa facility, solve puzzles, and attempt to escape. Although Half-Life's graphics are beginning to look a little dated, the gameplay still holds up. At the time of release, Half-Life was an incredible experience, without proper "levels," but with an environment that flowed throughout the game. Our list of old PC games terminates with Thief, the classic first-person stealth game. Stealth games can look back at their past and see Thief firmly as the genesis. Or, if not the genesis, one of the first stealth games whose environment and soundtrack made sneaking around feel right. Add in different ways to move through each level, combat, and a steampunk-esq setting, and Thief is a fantastic game that's still worth playing to this day. What Are Your Favorite Old PC Games? There are so many brilliant old games to choose from. Which made picking this list incredibly tricky. Other games that could make the list include Deus Ex, Ultima 7, The Secret of Monkey Island, Warcraft II and III, Star Wars: TIE Fighter, Myst, Unreal Tournament, and Planescape: Torment to name just a few. The only stumbling block is that some old PC games won't work with Windows 10. If you encounter this problem, here's how to use old games and software on Windows 10.